Stormwater runoff presents both growing challenges and opportunities for Bay Area watersheds and their residents. 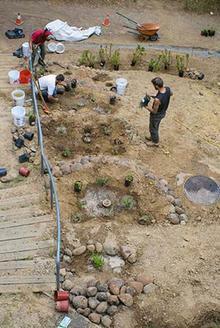 Let DIG Cooperative help you control rain runoff the natural way! Many ﬂooding and structural damage issues can be addressed by diverting surface and ground water away from your development via earthworks systems that slow, spead and sink stormwater on-site and harvest it as a life-sustaining resource. We can help you control and catch storm water for irrigation supply and indoor domestic use, or drain it to a rain garden and filter it through a bio-swale before it leaves your site. Ecological water diversion is a smart home and garden investment. Erosion and associated stresses can be mitigated by integrating a comprehensive strategy of earthworks and landscape solutions, rainwater catchment systems and protracted maintenance and stewardship of the site. Using a combined approach, DIG Cooperative will create regenerative systems that can reduce damage while increasing a landscape&apos;s capacity to harvest, control and reuse water naturally. Contact us to schedule an estimate for your custom project.